Bassist and backing vocalist Dean Bernardini has been with Chevelle since 2005, even though 2007's "Vena Sera" marked his first studio recording with the band. Bernardini's musical journey started with drums at age five, the instrument he was playing when he first came to know Sam and Pete Loeffler of Chevelle. The band was playing their first show at a battle of the bands in the Chicago suburb of Deerfield. Bernardini was drumming another local band at the same competition. The trio became fast friends. Musical collaborations ensued, though it would still be a few years before Dean would officially join the band as a bassist. Several years of touring and recording with Chevelle had honed Bernardini's skills as a bassist. His relationship with the instrument had deepened to the point of personal reinvention. Along with his rising level of skill came a desire to search out the bass that would serve his creative needs, as well as bring out the best in his favorite amp, a Mesa Boogie Big Block 750. 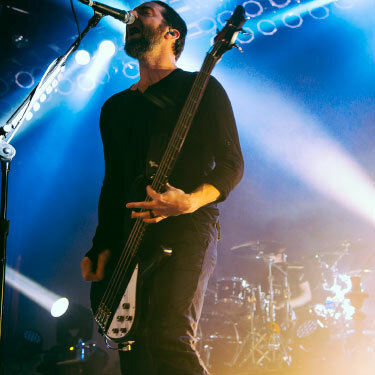 It was during the recording of Chevelle's "Sci-Fi Crimes" in Nashville, that his search brought him to the concept of a 35" scale neck-thru bass that also offered the level of tonal control that the recording demanded. An Ibanez BTB 1305E proved itself the perfect tool for the job ? the bass blended perfectly with the band's sound in the studio. By the time Bernardini was going to hit the stage with the BTB, further experimentation led him to a 4-string version, called the BTB570FM. For live performance Dean felt he'd found THE ONE. He snatched up every used BTB570FM he could find to bolster his live arsenal.